The groupers, hinds and lyretails of the Family Epinephilidae are one of the most speciose groups associated with tropical coral reefs, but, despite this immense biodiversity (~16 genera, ~165 species), few species make their way into the aquarium trade and fewer still are considered attractive enough to be desirable. The Coral Hind (Cephalopholis miniatus) is probably the most popular and affordable offering, followed by rarer and pricier species like the Polleni Grouper (C. polleni), the Spanish Flag (Gonioplectrus hispanidus) and the virtually unobtainable Neptune Grouper (C. igarashiensis), but perhaps the rarest of the bunch is a beautiful and obscure caerulean fish that few have ever seen in the flesh—the Cobalt Slender Grouper. This stunning piscine sapphire has been popping up in aquarium exports from the Red Sea for decades now, but its precise affinities have remained murky. Scott Michael astutely considered this as a variation of the Slender Grouper (E. leucogrammicus), but there is reason to believe the story may be a bit more complex than that. One point to consider is the size at which these blue specimens are exported at, generally no more than a few inches in length. Considering that the maximum size of E. leucogrammicus is reported as being over two feet, these little blue groupers are clearly just juveniles. This is quite important, as there is a considerable difference in appearance with age. One of the most remarkable aspects of the Slender Grouper’s life history is the extraordinary mimicry that juveniles exhibit—this fish has an uncanny resemblance to the females of certain Halichoeres wrasses (e.g. H. melanurus, H. chrysotaenia, H. richmondi, H. kallochroma). While it doesn’t appear to have ever been studied in any rigorous manner, the assumption is that this is “aggressive mimicry”, wherein the predatory juvenile grouper is able to sneak up on unwary prey due to its resemblance to a harmless wrasse. 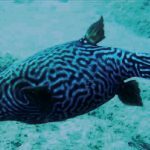 But it’s important to keep in mind that, while the wrasses occur only as far west as the Maldives, the Slender Grouper can be found everywhere in the Indian Ocean and Red Sea. 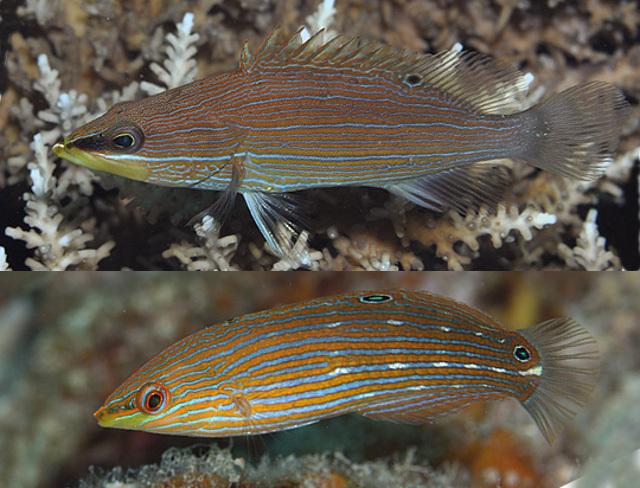 Obviously, for a grouper living in the Red Sea or along the African coastline, it makes little sense to mimic a species of wrasse which doesn’t occur there. And, not coincidently, it is here (in the Red Sea, at least) where we find the bright blue juveniles of the so-called Cobalt Slender Grouper. Unfortunately, there is little photographic documentation to indicate what the juveniles look like outside this region. Are specimens from Africa and the Mascarenes similarly hued? 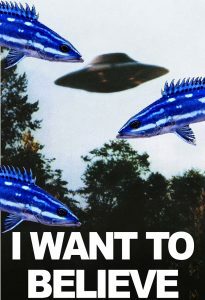 And, more pointedly, why is this fish blue in the first place? 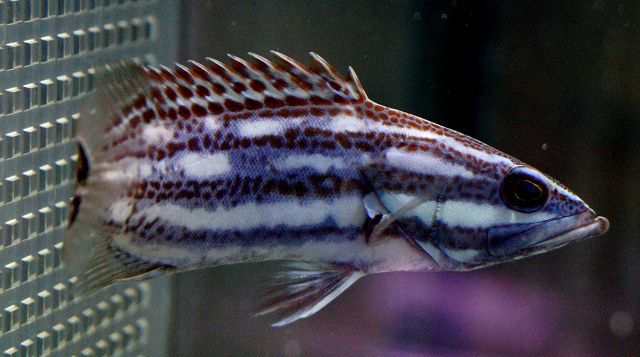 Taxonomically speaking, the Cobalt Slender Grouper has been treated by most aquarium sources as a regional variation of the widespread Epinephelus leucogrammicus, but this issue has yet to be addressed by the scientific community. 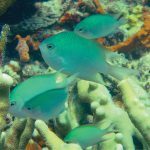 That these blue specimens are apparently restricted to the Red Sea—a region devoid of the wrasses that are mimicked elsewhere—is a strong indication that this population may be deserving of its own species status. However, things may not be quite so straightforward. ML CO1 phylogeny. The genetically distinct Indian Ocean population is highlighted in blue. Data from GenBank. 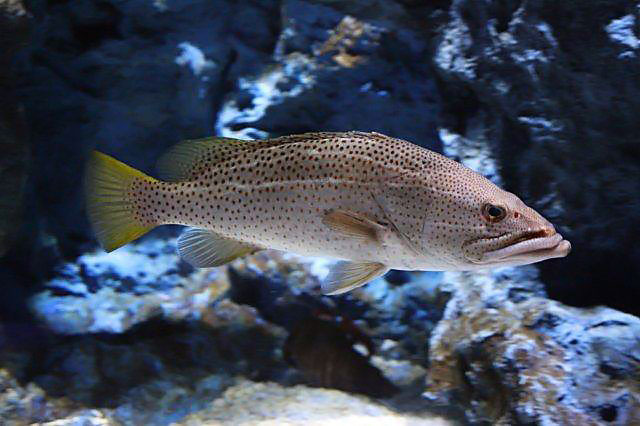 In examining available genetic sequences from across the Slender Grouper’s range, there appears to be a strong indication for the presence of cryptic species, split between the Indian and Pacific Oceans. The phylogenetic tree shown above gives an idea of this, with the differences between their respective mitochondrial CO1 genes being approximately 3.8%. This is more than enough to warrant separate species status. Of course, it’s important to keep in mind that specimens from the Red Sea have yet to be studied in this manner, so it’s not implausible that this restricted population of blue groupers might be found deserving of its own species recognition as well. 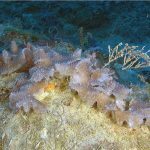 There is in fact a previously published name for Red Sea specimens—E. micronotatus (Rüppell 1838) from Massawa, Eritrea—while those from the Indian Ocean have never been scientifically described. Clearly, a great deal more taxonomic work remains to be done here. A word needs to be said concerning the evolutionary history of the Slender Grouper with respect to others in the Family Epinephelidae. Several recent studies have examined this important family in exquisite detail, providing a nearly comprehensive look into the origins of grouper biodiversity. 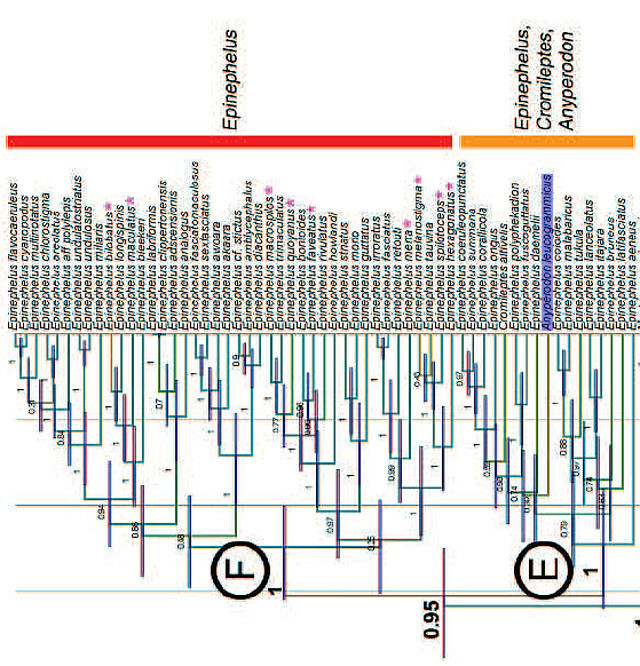 One of the more surprising findings, confirmed by three separate genetic studies now, is that the Slender Grouper (formerly treated as belonging to its own genus, Anyperodon) is in fact nestled deeply within the Epinephelus lineage. 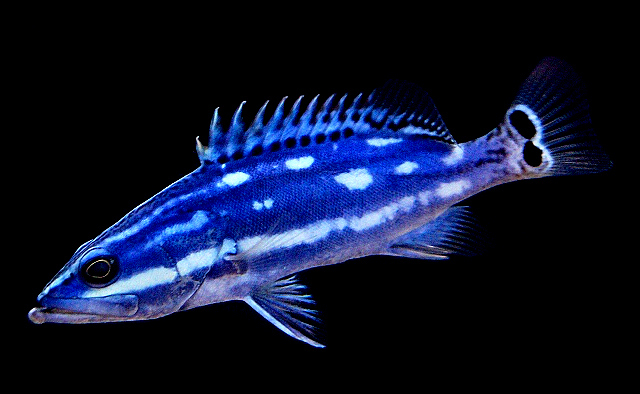 A revision of the group’s taxonomy published in 2007 explicitly reclassified the species as Epinephelus leucogrammicus; however, most sources have failed to follow this change thus far. 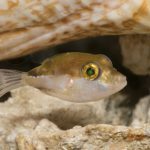 Obviously, I have chosen to buck this trend and follow these genetic findings, treating “Anyperodon” as a synonym in this article, but it bears mention that Epinephelus is a genus which may deserve to be split further at some point, so the nomenclature may yet change. In ending this discussion, we need to point out a grim reality here—adult Slender Groupers all look more or less the same. That pretty blue fish that you are paying exorbitantly for could eventually lose its colors and metamorphose into a relatively somber, orange-spotted beast. The price for Red Sea specimens can vary wildly, with individuals having been offered anywhere from $350 to $2,700 for a recent Japanese specimen!!! For that kind of money, I’ll take a Neptune Grouper… at least we know that fish keeps its gaudy colors. Update #1: After posting this article, Barnett Shutman of RVS Fishworld recounted his own experience with collecting this fish. 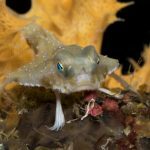 He states that specimens have been encountered at depths of 120-180 feet and in close association with specimens showing the typical brown juvenile coloration. In fact, the pair of individuals shown below were found together in a cave along a Sudanese reef. Another individual shown here (link) was said to have been observed at 25 meters off Djibouti, and Scott Michael mentions a specimen from 60 meters. Barnett went on to say that in the two decades he has dealt with this blue fish, his customers have yet to report it changing color into the typical pattern of E. leucogrammicus. So what are we dealing with here? Are there two species of Slender Grouper in the Red Sea delimited by their depth preferences? Or is there a single species which happens to have an exceedingly rare blue variation? 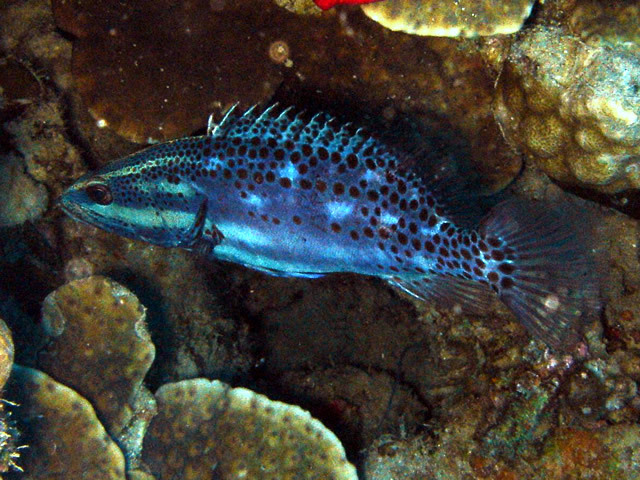 It seems remarkable that something as obvious as a bright blue grouper could go undetected in a region so well-studied as the Red Sea, but, then again, the mesophotic reefs are poorly explored. Update #2: Dr. Luiz Rocha reports that he has sequenced this blue grouper and found that it is identical to those found elsewhere in the Indian Ocean, which for now puts to rest the notion that the Cobalt Slender Grouper is a separate species. Dr. Rocha also confirms that there is a split between Indian and Pacific Ocean populations, so perhaps someday this fish may find itself known under the name “Epinephelus micronotatus”.